Quality therapeutic relief from Back on Track, in the convenience of a polo wrap! The Back on Track Polo Wraps are made with a state-of-the-art fabric which contains polyester thread embedded with a fine ceramic powder. Designed to reflect the horse's own body-warmth, it creates a soothing far infrared thermal heat, which can help alleviate pain associated with inflamed muscles, ligaments, tendons and joints. Used for both daily therapeutic conditioning as well as injury recovery. With slightly more stretch than traditional polos, these wraps offer excellent support. Pair. Designed to be used only during exercise. Please read carefully, both the usage and washing instructions, before using the product. All Back on Track products should be implemented gradually. To start with, use the product for a maximum of four hours a day for the first 2-3 days. The body then has the opportunity to familiarize itself with the fabric’s effects. The reason we recommend starting with a maximum of 4 hours use is that some people experience pain in the beginning. In horses and dogs, it manifests itself as a swelling. This is due to the increased blood circulation, which is actually a good indication that the ceramic fabric is taking effect. This initial pain or swelling can occur anywhere from a few to several hours of use. You should then cease using the product any more that day, and instead introducing it carefully and more gradually over the following days. After the introductory period you should up the usage to a minimum of 8 hours per day, preferably more. After only an hour or so is often perceived a positive effect on tight muscles and stiff joints. More persistent problems may require several days, usually between 10-20, before the desired result is achieved. After the introductory period of 2-3 days it is important to continue to use the product intensively at least 10, preferably 20 days, before assessing its impact. Since this ceramic fabric reflects more of the body’s heat radiation as you move, the effect is greatest if you wear the product when active. Back on Track also works when resting, even when you sleep. Continue to use the product according to the routine you develop, or use it for two weeks and then take a break in the third week, this in order to avoid dependency. The sensitivity of this dependency varies from individual to individual. For maximum effect, the ceramic fabric should be in direct contact with the skin (if necessary, a thin cotton cloth inserted between). Note: Caution is advised during simultaneous use with liniment or similar, since the effect is amplified. Use the product only as directed and consult a doctor if symptoms persist. Do not use during pregnancy. Keep in mind that the effect of Back and Track increases with movement when the body heat increases, so in addition to using pads and blankets in the stables, the horse can also be allowed to move around with the Back on Track products. Especially suitable in this context is Riding Boots, Leg Wraps, Saddle Pads, Exercise Sheets and Blanket/Sheets. For long term problems, the horse may need to use Back on Track for an extended period. Use the product for two to three weeks and have a break one week, to see if the symptoms persist. As a preventive measure, Back on Track can be used with regular breaks. Use Back on Track 1 day before and 2 days after exercise and then stop until the next workout. For warm-up, use 1-2 hours before and 2-4 hours after exercise. For dogs, one often uses the standard Dog Blanket, which is rain repellent and breaths. However, it should be noted that for long-running problems, Back on Track should be used for several weeks, at least 8 hours per day, with regular breaks in order to achieve the desired results. This means that the dog can use the blanket day and night, indoor as well as outdoor, 24/7. If being used at night, it is probably more comfortable for the dog to wear the Mesh Blanket, which is more adaptable. Alternatively, the dog may be provided with a mattress with "memory foam" or a cover of Back on Track to the sleeping basket. The foam part molds to the body shape and relieves a sore back. Back on Track products can be machine washed up to 86°F or 30°C. Use normal detergents that do not contain bleach or fabric softeners. Air dry only, do NOT tumble dry. Note: Do not use bleach or fabric softener, or tumble dry. The product should be ironed at a maximum temperature of 122 F The ceramic powder is fused in the fibres of polyester/polypropylene and does not separate when washed. The textile loses efficiency with time and extended use. The textile is produced in China and consists of 100% polypropylene (PP) with ceramic powder or 50% polyester with ceramic powder and 50% cotton. Eskadron Climatex Bandage Liners improve air circulation and wick moisture away from the horse's legs. Ideal padding for training bandages. Can also be used with stable bandages or as a medical dressing. Set of 4. 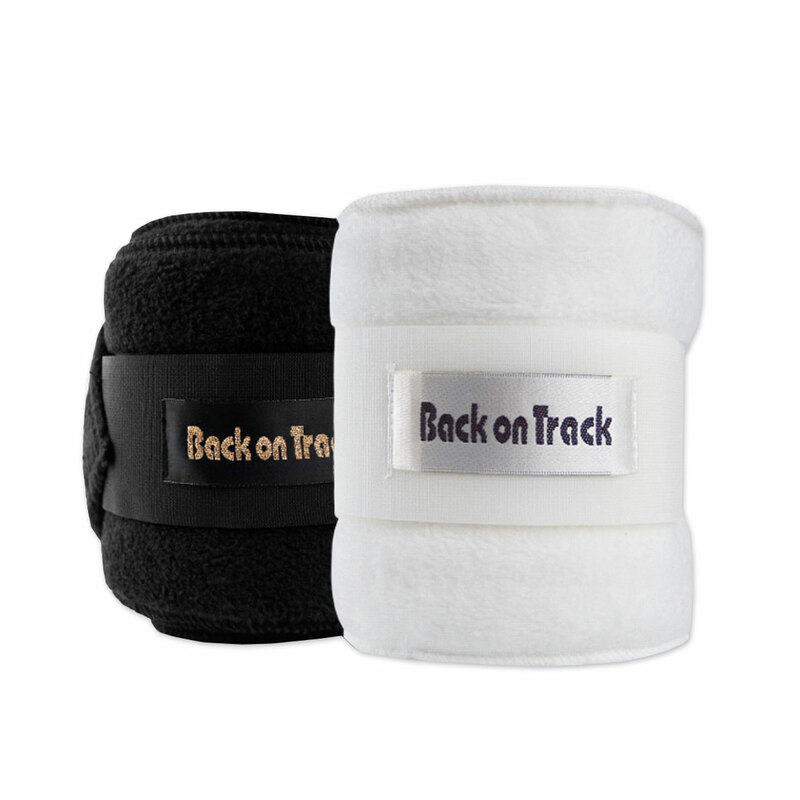 Back on Track Polo Wraps is rated 4.6 out of 5 by 66. Rated 5 out of 5 by DC1111 from Great material! The wraps are great material. They stay on great and are very easy to wrap. Rated 4 out of 5 by DeMauroEventer from Love Back On Track Used these in a clinic. Really liked them but they did slide a little on the hind legs. Rated 5 out of 5 by LydiaLily from Nice thickness I like these polos for their therapeutic properties as well as their thickness. Many polos these days are too thick. These do the job with out the bulk. I can't comment on durability as I have only had them a month. Rated 5 out of 5 by Barbara from Perfect for Stocking Up/Arthritis My mare is 24 and has old dings in her back legs from her previous career, as well as mild arthritis in her hind left. Sometimes she comes out of her stall stocked up and stiff. We've been cold-hosing, using ice-tight, and joint supplements to combat this, but I figured why not try another approach as well. Standing wraps are not an option for us, so I bought these polos since we needed new ones anyway. I am so impressed with the results! After just an hour of wearing them, her legs are completely drained and tight. I've started putting them on whenever we go out, even if she's not stocked up as a preventative measure. They really do seem to help stimulate blood flow. As far as the quality of the polos, I think they're great, and I used to be a polo groom, so I've wrapped a lot of polos in my day! They are flatter and stretchier than a lot of the fleece ones I've used in the past, but I had no problem getting them right on the first try. I see a lot of people here complaining about size and gapping, but for me it wasn't an issue. The regular size fit my 15'2 horse well. I didn't notice anything funky with the velcro. Maybe they've fixed those issues in the newer ones? Rated 4 out of 5 by hnterjmper from I have been trying many different brands of polos to see which I like the best and I have to say these are at the very top of my list. My favorite thing is that hair easily can be brushed off of the polos, thrown in the wash, and look brand new. They wrap nicely and don't slip after a long ride. Rated 4 out of 5 by Caitlin C from Will never wrap correctly, but still a good polo. Like some other reviewers have mentioned, these polos will always leave a gap at the top. I've found that if you put a couple layers under the part where you velcro at the top it helps fill in some of the gap, but they will never be perfect. If you can get past this, they are excellent polos that do work like it says they do. I've had the polos forever, but currently using on a horse in bowed tendon rehab and I've found that her leg recovers better post-ride when wearing these during our rides vs. wearing anything else. Rated 5 out of 5 by kiamir from Work well! This is my horse"s second pair of Back On Track Polo Wraps. First pair has had Lots of use (and washings) and continue to be useable ,however, have become have become rather stretched out. My Horse has had considerable suspensory problems and these wraps have been a great aid with his comfort and mobility. Rated 5 out of 5 by AlexaB from Great polos Bought these recently for my 5year old OTTB. He had a year long rehabbed bow in his front right and is completely healed. I wanted the support of a polo for his tendons. I've also seen the BOT quick wraps and sheet work on other horses in my barn and thought that these polos would add a little something extra. My horse's legs have been completely cool and these wraps withstand lots of running around and lunging sessions too. They brush off clean and though I've only washed once, seem to hold up! I am air drying them as I write this. I did have to cut some fabric off the end as they were too long for his front legs. I also had to change my wrapping teqnique. Rated 2 out of 5 by WhyMe from gap-y at the end of the wrap I really wanted to like these. The two layers are stitched and create a bit of a ruched edge. As you wrap it can easily be straightened - as you pull the wrap to be snug around the leg the fabric stretches a bit and the edges straighten out. But at the end of the wrap with the velcro stitched in, when you pull, you don't actually stretch the wrap at all-you are just pulling on the not-stretchy velcro- so you have a big gap where the end of the wrap does not lay flat against the leg. Returned.